Summer is not my favorite season. You'd think have more free time would be good? Not for me. I always look forward to have more free time, but honestly that's when my anxiety goes up! I really need things to do or else well I spend time thinking and worrying. My summertime worry has hit me hard this week, and now I need to find some things to fill up time. I'm thinking of adding another volunteer day in my schedule. I'd also like to take up some sort of fun hobby. Any suggestions? Anyways, in the spirit of trying to chase the worries away I have China Glaze Keep Calm, Paint On to show you all today. 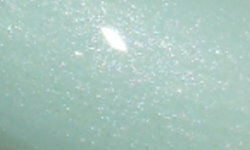 Keep Calm, Paint On is a soft sea foam green with a subtle shimmer. Color: I love this color. This is soft and serene. I always worry colors like this will look harsh against my paler skin, but this is very flattering. I really can't think of another color like this. Formula: I was nervous that this would be sheer or chalky, but it wasn't. The formula on this was nice and easy to use. I used 2 coats for the swatch above. Price: I believe I paid around $7 or $8 for this at Sally Beauty Supply. I'm sure you can get this cheaper from e-tailers, Amazon, or eBay though. Overall: I really like this color! Soft greens have been a favorite of mine this season. No complaints. This is really pretty! I like it. Personally, I love swimming, writing, and drawing during the summer. I also have these interactive books that are like little projects. I have This Is Not A Book and Wreck This Journal, both by Keri Smith. I haven't actually used them yet, but the concepts are really fun. Basically each page has a different task that you have to complete. I have another book called The Happy Book, which I haven't used, but I love the idea behind it. You just write or draw things that make you happy, whatever it is that the page tells you to do. I also own My Wonderful World Of Fashion, which is basically a huge coloring book revolved around fashion. You don't just color, you can also create your own designs and patterns. They even have a page of nails where you can draw your own designs. The book might be a little kiddish for some, but it's really fun and I think coloring can be really therapeutic. Those are just some ideas of mine! Sorry for writing a novel. I hope you find something that can ease your mind.